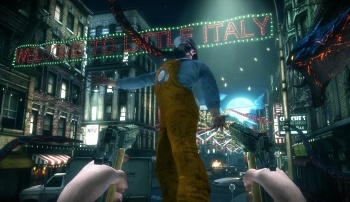 Publisher THQ has unveiled its plans for the upcoming The Darkness II demo, and they're unexpectedly complex. Instead of simply dumping a demo onto the major platforms all at once, THQ has decided that staggering the release based on some kind of arcane profitability index is the best course of action. Thus, American Xbox Live Gold members will get first crack at the title, while European PlayStation 3 owners will have to wait to get their fix of demonic entities voiced by the lead singer from Faith No More. So, in conclusion: This is great news for those who routinely shell out the cash to subscribe to Microsoft's premium online gaming service. That $70/year just bought you a chance to be among the first to play the highly anticipated sequel to the creative, quirky, wildly underappreciated The Darkness. Congrats on that one guys. On the other hand, I'm sorry to be the bearer of bad news for those of you devoted to Sony's platform. If it makes you feel better, you can totally spend that week in PlayStation Home. That's still a thing you guys do, right?